Take a look at the clinical values supported by our products and explore how patients, physicians, and the hospital management can benefit from intelligent features customized to support the crucial tasks of antimicrobial stewardship. TREAT Steward™ increases coverage of empirical antimicrobial treatment while reducing the use of antimicrobials in general, and broad spectrum antimicrobials in particular. As a result, TREAT Steward™ creates savings in terms of bed-days and lives, and reduces the spread of antimicrobial resistance. TREAT Lab™ accurately stratifies patients according to their likelihood of bacteremia and of death within 30 days. This risk-based stratification enables cost effective use of rapid diagnostics, both on direct blood samples and downstream of positive blood culture. TREAT Steward™ can reduce the risk of unwanted side effects when suggesting antimicrobial treatment by ordering treatment suggestions according to the hospital´s antimicrobial guidelines. This helps the clinician make the best possible choice of treatment - in line with hospital antimicrobial guidelines. TREAT Steward™ has been tested in clinical trials involving more than 7,500 patients as seen in the table below. The trials were performed in several hospitals with differing clinical setups and different levels of resistance; both high and low bacterial resistance areas were included. Results have been reproducible and shown that clinicians supported by Treat guidance can provide higher percentage of microbiologically covering antimicrobial treatments to their patients compared to clinicians without access to TREAT. On average, studies have shown a potential improvement empirical coverage from approximately 60% without TREAT to 75% with TREAT. The main multi-center study in Germany, Italy and Israel showed not only showed an increase in covering treatment, but also a significant reduction in the duration of the hospital stay. Studies also showed also a reduction of approximately 50% in both the antimicrobial and ecological costs. The ecological savings reflect a corresponding reduction in the prescribing of broad-spectrum antimicrobials. 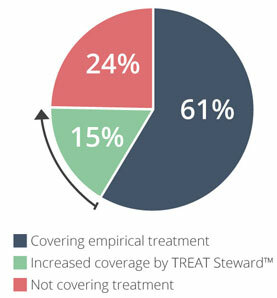 On average TREAT Steward™ would save 1/3 of the use of broad-spectrum treatments. An example of the most recent study at Rabin Medical Center – Beilinson Hospital is shown in the figure. 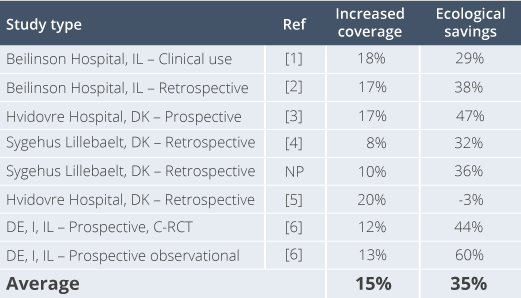 The figure illustrates the shift in the use of broad-spectrum treatment while improving empirical coverage by 15%. Overview of the clinical results obtained by TREAT Steward™, IT = Italy, IL = Israel, DE = Germany, DK = Denmark. Ward et al. (2017) Implementation of antimicrobial stewardship using an IT-based decision support system. 27th European Congress of Clinical Microbiology and Infectious Diseases (ECCMID), Vienna, Austria. Andreassen et al. (2017) A retrospective study of the performance of decision support for empirical antibiotic therapy. 27th European Congress of Clinical Microbiology and Infectious Diseases (ECCMID), Vienna, Austria. Arboe et al. (2014) Evaluation of the decision support system for antimicrobial treatment, TREAT, in an acute medical ward of a university hospital. International Journal of Infectious Diseases 29, 156-161, DOI: 10.1016/j.ijid.2014.08.019. Østergaard et al. (2013) Retrospective cohort study evaluating a computerised decision support system (TREAT) for guidance of empirical antimicrobial therapy of bacteraemic episodes in an area with a low prevalence of resistant pathogens. 23rd European Congress of Clinical Microbiology and Infectious Diseases (ECCMID), Berlin, Germany. Kofoed et al. (2009) Performance of the TREAT decision support system in an environment with a low prevalence of resistant pathogens. Journal of Antimicrobial Chemotherapy, 63(2), 400-404, DOI: 10.1093/jac/dkn504. Paul et al. (2006) Improving empirical antibiotic treatment using TREAT, a computerized decision support system: cluster randomized trial. Journal of Antimicrobial Chemotherapy, 58(6), 1238-1245, DOI: 10.1093/jac/dkl372. At a hospital with an uptake population of 400,000, TREAT Steward™ is expected to save 350 life-years every year. 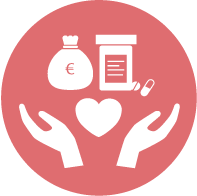 With an annual license fee of €110,000, the price per saved life-year is € 110,000 / 350 = € 314/life-year. This is an amazing 100 times less than the € 35,000/life-year considered a cost-effective intervention . The hospital can expect that TREAT Steward™ will help provide covering antimicrobial treatment for an additional 840 patients per year, saving 1,680 bed-days. At a price of € 400 per bed-day for an infection patient this amounts to € 672,000. Savings on bed-days thus pays for TREAT Steward's license fee six times every year. In addition, TREAT Steward™ can in most setting be expected to reduce the use of broad-spectrum antimicrobials by approximately 33 % – thus reducing the rate of emergence of resistant bacteria. 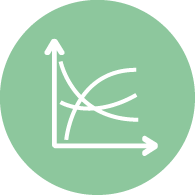 TREAT Steward™ takes direct drug costs into consideration when suggesting treatment, and direct drug costs are a part of the calibration specific to the local hospital. 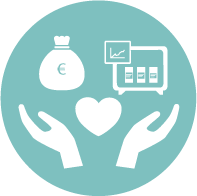 This allows the hospital to potentially save money since direct costs are integrated into TREATs decision on best possible treatment. In previous installations, TREAT Steward™ has caused a reduction in direct costs of antimicrobials. Using TREAT Steward™, a large number of bed days can be saved due to higher rates of covering treatment prescription. Studies have shown that giving covering treatment to infectious patients reduces hospitalization by approximately 2.0 bed days per patient, compared to giving non-covering treatment. A "standard" hospital servicing a population of 400,000 will annually experience approximately 1.4% or 5,600 infections. 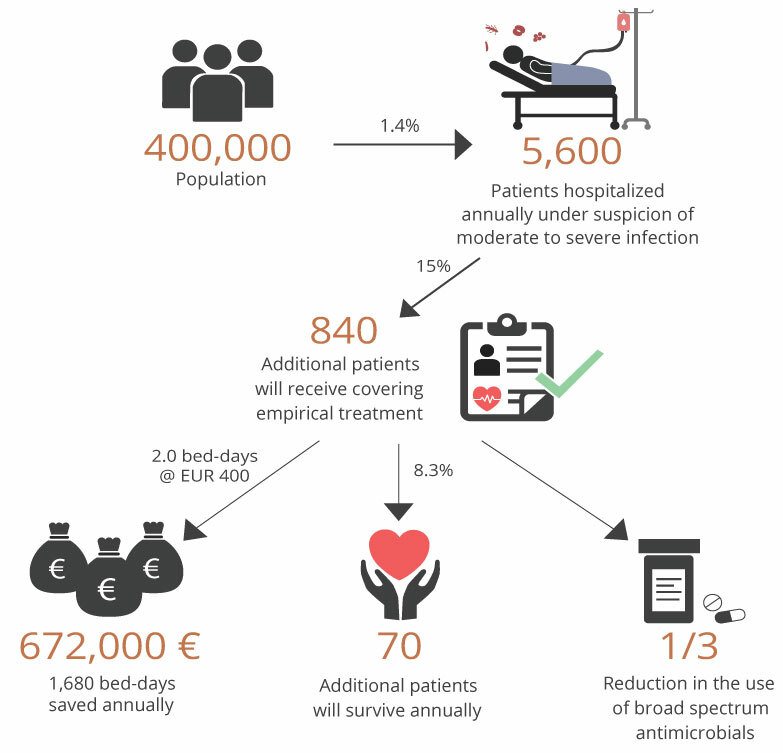 If Treat Steward™ increases covering antimicrobial treatment by 15%  then annually an additional 5,600 * 15% = 840 additional patients will receive covering empirical treatment. Assuming that two bed-days are saved for each additional patient receiving covering treatment  then 1680 bed-days will be saved at the hospital. If covering antimicrobial treatment reduces mortality by 8.3% , then 840 * 8.3% = 70 additional patients/year will survive. Assuming that saving a patient on average adds 5 years to the patient’s life then Treat Steward™ will save 5 * 70 = 350 life-years/year. NICE: UK National Institute for Health and Clinical Excellence, 2012. Fraser et al. (2006) Benefit of appropriate empirical antibiotic treatment: thirty-day mortality and duration of hospital stay. The American Journal of Medicine 119:970-6, DOI: 10.1016/j.amjmed.2006.03.034. Risk assessment in both TREAT Steward™ and TREAT Lab™ utilize variations of the SepsisFinder model: a partial model of the inflammatory response to infection . SepsisFinder uses a range of routinely measured “infection variables”: vital parameters (heart rate, blood pressure, and temperature), clinical chemistry and hematology (leukocytes, neutrophils, platelets, creatinine, albumin, lactate and CRP). In response to the lack of clinical information (like vital signs) available in laboratory information systems (LIS), a lightweight version, SepsisFinder Lite, was constructed. SepsisFinder Lite uses only parameters regularly available in the LIS: leukocytes, neutrophils, platelets, CRP, lactate and albumin. Both versions of SepsisFinder show good discrimination across a range of patient cohorts (from Denmark, Israel and Italy) in predicting both 30-day mortality [1,2] and bacteremia [1,3,4]. Area under the ROC curve is typically 0.80 for the prediction of 30-day mortality and 0.75 for bacteraemia. 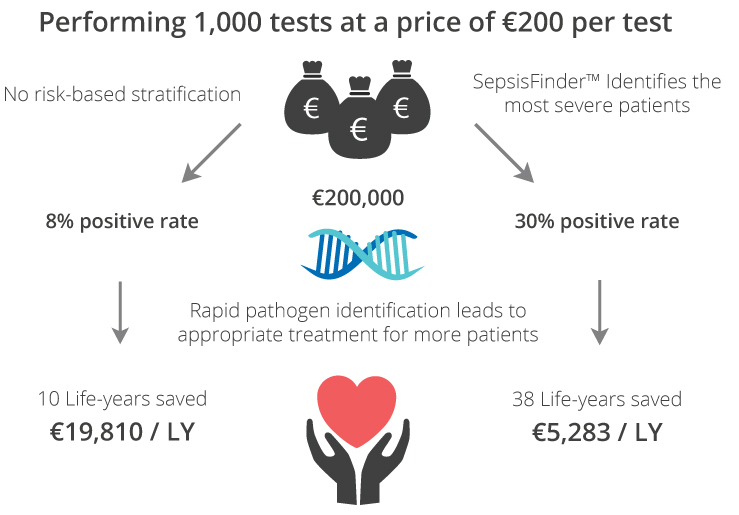 SepsisFinder’s good discrimination means that it can select high-risk patients – a subset of approximately 20% of those suspected of severe infection – with baseline mortality 2-3x higher than average, and bacteremia rates 2-4x higher than average. 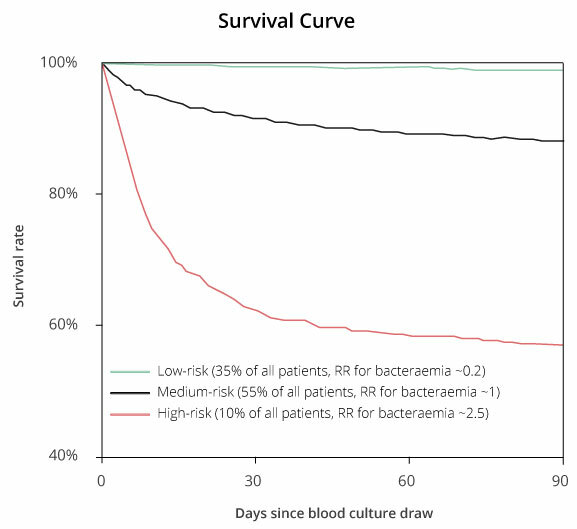 Survival curves for patients suspected for infection (blood cultures taken) for high-, low- and medium risk groups (RR = relative risk). Ward (2016) Gradation of the severity of sepsis. Phd Thesis. Aalborg Universitetsforlag. The diagnosis of blood stream infections is currently hampered by low sensitivity rates of both blood culture and direct PCR, and the lack of a definitive gold standard. This significantly reduces the value of a negative test. PCR-based rapid diagnostics have shown some utility in identifying pathogens 24-48 hours prior to blood culture. However, they are too expensive to be used for all patients suspected of infection. In order to ensure that the full benefit of rapid diagnostics is realized, they need to be targeted towards a sub-group of patients with a higher pre-test probability of positivity, who also have high mortality. These are the patients who will benefit most. Risk-assessment within TREAT Lab™ is able to select patients with a pre-test probability of bacteremia 2-4x higher and mortality 2-3x higher than an average group for patients who had blood cultures drawn. The figure presents a method for estimating the cost-effectiveness of adding rapid diagnostics as an adjunct test for high-risk patients. It is assumed that budget constraints allow for 1,000 tests to be performed at the cost of €200 per test. 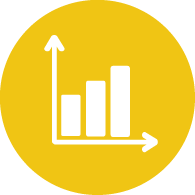 Without risk assessment, the expected positivity rate is 8%, while TREAT Lab™ can identify a high-risk group where 30% of the tests will be positive . Rapid pathogen identification leads to a greater number of patients receiving appropriate treatment, which results in a reduction in mortality. 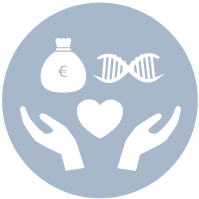 For the same cost, TREAT Lab’s selection of patients for rapid diagnostic testing can save more patients than rapid diagnostics alone. Patients surviving sepsis have an average life expectancy of 5.4 years. New emerging methods for rapid AST direct from positive blood culture bottles make it possible to cut the time to result by 18-36 hours compared to conventional methods, but the additional cost means they are not used for all patients. In order to optimize their use, a reliable risk assessment method is needed to stratify patients. By selecting a group of patients with high baseline mortality, an opportunity is created for saving a greater number of lives. Risk assessment with TREAT Lab™ is able to select patients with baseline mortality 2-3x higher than an average group of patients who had positive blood cultures. The figure presents a method for estimating the cost-effectiveness of adding rapid diagnostics in the form of rapid AST as an adjunct test for high-risk patients. It is assumed that budget (and throughput) constraints will allow for a large laboratory to perform rapid AST on 20% of 30,000 positive blood cultures per year. Without any selection, 30-day mortality is expected to be 15%, while TREAT Lab™ can identify a high-risk group with 33% mortality. 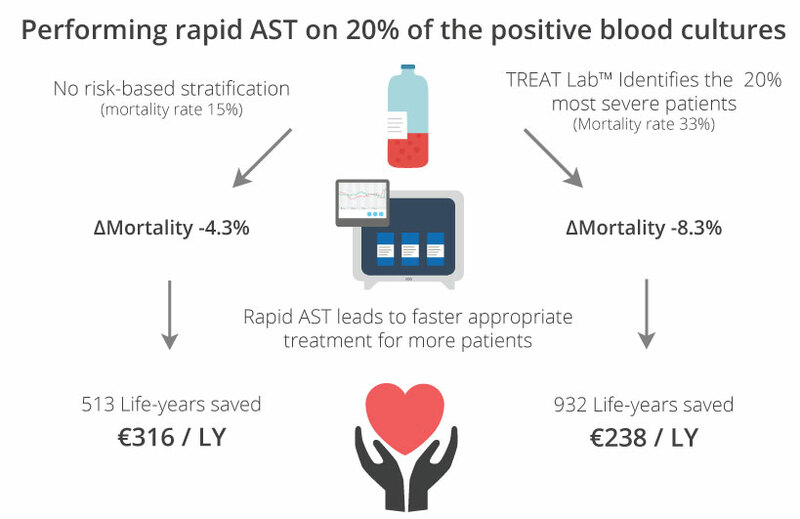 Assuming a fixed odds ratio for the reduction in mortality due to earlier appropriate treatment leads to an incremental cost per life-year saved of €316 without risk assessment and €238 with TREAT Lab™ . Andreassen et al. (2017) Cost-effectiveness of MALDI-TOF and rapid antimicrobial susceptibility testing for high-risk patients. 27th European Congress of Clinical Microbiology and Infectious Diseases (ECCMID), Vienna, Austria.